A few years ago, when my book Being Me with OCD was just coming out, my brother sent me a link to a local TED Talk. I could see why: The speaker, Solome Tibebu, bravely opened up about her personal experiences with obsessive-compulsive disorder (OCD) and anxiety. But that wasn’t all—she also shared how, at age 16, she founded a nonprofit called Anxiety in Teens! Since then I’ve had the pleasure of meeting Solome in person at the OCD conferences, and I’m honored to host her today. She’s taking the world by storm! I gotta say, when I was 16 I definitely struggled with anxiety and undiagnosed OCD, but for the most part my mind was on getting boys to like me and trying to fit in at school. You founded a nonprofit, Anxiety in Teens! How did this all come about? My mind was definitely on those things, too! 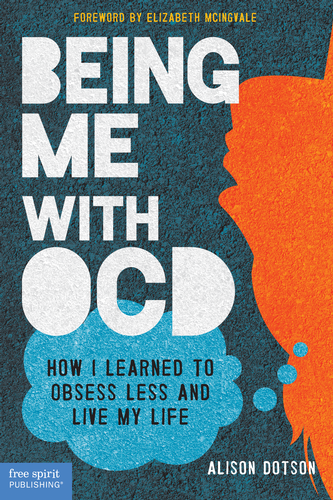 But, after the OCD continued to exasperate me, I found power and relief in going to my local Barnes & Noble or searching the web for any information about anxiety that I could. One of my later therapists explained to me that what I was seeking and gaining from this research was called psycho-education, and each epiphany I had about what was going on in my mind and body was called cognitive restructuring. They sounded like really big words but I loved the sound of it—I figured out early on that these breakthroughs were one of the most powerful aspects of managing my OCD and anxiety. As I started collecting these resources and turning to them time and again, I often thought about how access to this type of information was so critical to help me through my time of need. There weren’t as many resources aimed at young adults dealing with mental health issues as I would have thought or liked at the time. I was accustomed to reading online magazines aimed young women yet also reading stuffier, less-personal clinical sites about anxiety disorders. Of the few personal blogs I found online that were focused on OCD and anxiety, I found their anecdotes eye-opening and comforting. I thought, wouldn’t it be nice if there was a place that could offer all of these things! I tried various platforms to get started. I had my cousin help me set up a very basic blog, I think I recall Yahoo! business pages as one of my early iterations. Over the years, I would learn a little more about OCD, improve the website a little more, and learn more about starting up an organization. Later, in college, I wanted to continue improving the design of the site but had little resources. I googled, “Minneapolis web design,” and clicked on the first listing of the search results. Turned out to be an agency that was just a mile from my college. I cold called the CEO of Rocket55, Steven Ayres, and asked if he’d help me with my website in exchange for interning for him for free. We met in person that afternoon and he agreed (he later hired me, and they did, in fact, greatly improve the site!). The Minneapolis community was wonderful in terms of their willingness to help young people get their ideas off the ground, including resources like Ashoka YouthVenture, the local startup community such as Project Skyway, and the resources at my university, University of St. Thomas. You have OCD yourself. When did you realize you had it, and how long did it take to get the proper diagnosis after you first started experiencing symptoms? Somewhere around sixth or seventh grade it became evident that I was developing OCD, along with some significant anxiety problems (panic attacks, etc). It started out with what appeared to be separation anxiety, where I never allowed a family member out of sight without a serious panic attack. As I started to address the panic attacks, the OCD really started to take hold. I saw a couple therapists for a year or two at a time without seemingly much help. My family and I continued with these therapists because honestly, we didn’t know if there was anything better! The same could be true of medications. It wasn’t until the fourth try that I finally found someone effective, which gave me a better perspective to see that those initial sessions were not very helpful. Now, I would recommend seeking out an OCD specialist from the onset. In 2012 you gave a local TED Talk. How did you go from dealing with daily anxiety to standing in front of an auditorium full of people to share personal details about your life? Surprisingly, the public speaking wasn’t an issue. I was just so excited to tell my story and finally articulate what actually worked for me. I worked hard to condense what I had learned over the course of my teens and express these insights as clearly as I could in under 15 minutes. I was motivated to offer information to those in the audience about how they could be effective allies. At the same time, I also understood the responsibility of articulating OCD as best as I could for those in the audience who were not familiar with OCD. There is so much misinformation about OCD, with the media constantly characterizing individuals as cleaning cartoons. My hope was that they could hear one person’s story and, while we may come from completely different walks of life, perhaps they could relate to me on some level even if they wouldn’t be able to 100% understand OCD. From there, they could be empowered to address their own OCD or assist someone else more effectively, with compassion and better understanding. In that TED Talk, you said you were worried, as a seventh-grader, that you might be pregnant if you didn’t eat the “right” number of M&Ms. Of course we know that there’s no biological connection between the two, so how did you explain these fears to others? I didn’t. It was just so impossible trying to articulate what I the experience was like and attempting to get others to understand. If I could even get myself to share such an awkward topic, others would be quick to respond with, “What? That is literally crazy. You know it’s not true, just move on!” As I’m sure you know, the experience of trying to explain OCD and the odd contents of it to other people is just so exhausting that I wouldn’t even bother. Unfortunately, that means suffering can continue in silence. And how did you tell friends and family about your diagnoses? What advice do you have for teens who want to tell people they have OCD but are worried about being judged or misunderstood? With the sometimes extreme anxiety and OCD symptoms I displayed, it was hard to hide from my family. They knew about many of the contents of my anxiety—such as the separation anxiety—but other topics, not so much. To some extent, I kept it a secret so I could control certain aspects of my environment—I knew they were highly invested in my well-being and it seemed to me they would often get overwhelmed when we discussed or addressed my anxiety, so at the time I felt it better to lay low. But for the most part, I knew I couldn’t barely explain my OCD if I wanted to! As the first American-born in my family and parents both coming from very different backgrounds themselves, there was the additional complexity of cultural barriers such as high stigma and lack of even a word for OCD in their languages. Fortunately, although I didn’t talk much about my anxiety or OCD, they were committed to taking me to get as much help as I needed. If you’re a teen and you are concerned about sharing your OCD, I would recommend starting with discussing it only with whom you’re comfortable and when you’re comfortable doing it. At first, this may just be your therapist. No one is forcing you or rushing you to share the details of your health and healthcare, and I believe pacing your self-disclosure on your own time is best. Your first priority should be your well-being, and if that means getting your feet on the ground and just discussing it with your therapist to building a strong foundation, then so be it. Later, as you develop the right skills and find what really helps you, you may be inclined to share it with others. Starting with meeting other individuals with OCD (such as at the International OCD Foundation [IOCDF] conference) may be an easier first step, because you know right away they can relate and offer a strong support system. More than a decade after launching, Anxiety in Teens is still going strong. How has it evolved over the years? And what are you up to now–other than moving away from the best city in the world, Minneapolis, to ho-hum New York City? While I do miss the five days that is summer in Minnesota, New York City has been great! Since Minneapolis, I’ve had the opportunity to work with tech startups and later for the largest mental health EHR software company. More recently, I am going back to startup life as I pack my bags for San Francisco next month to help advance healthcare quality at a new startup. Anxiety in Teens has definitely evolved and I look forward to it continuing to do so. The process of writing and expressing my story, researching evidence-based strategies and summarizing the psycho-education once I had put it in practice in my life had been a very therapeutic process in and of itself for me. Later, along with the University of St. Thomas, we developed our own Learning Through Service programs for other young adults to gain a similar experience while learning the ins and outs of a 501c3 nonprofit. Each semester, I continue this program, and each season we evolve it more a little bit each time. There have been over 200+ young adults who have struggled with mental health issues participate in our Learning Through Service program. Here is an example of the experience. In addition, we do live events! Our most recent OutRun Anxiety 5K Walk/Run for Teen Mental Health took place in Tucson, but we got our start in Minneapolis. In conjunction with our nationwide Contributor program, I have the honor of speaking on campuses and associations about mental health and social entrepreneurship. Finally, I am pleased to be making a difference at the IOCDF, where I sit on the Diversity Committee and assist with web/marketing activities. My advice for others struggling with OCD would be to stay mindful and regular with evidence-based techniques on an ongoing basis, such as exposure and response prevention. While not easy, these treatments work. In addition to reducing the OCD in the moment, staying abreast of these tactics and remembering to them even at a maintenance level can help you avoid OCD down the road in the event that you face stressful perfect storms down the road. As others on this site have recommended, I also suggest getting involved with the IOCDF. It is rare to find such a robust community of others with OCD in one place, and their resources are second to none.